CML Micro circuits is pleased to announce another successful year at the 2018 Electronica exhibition. 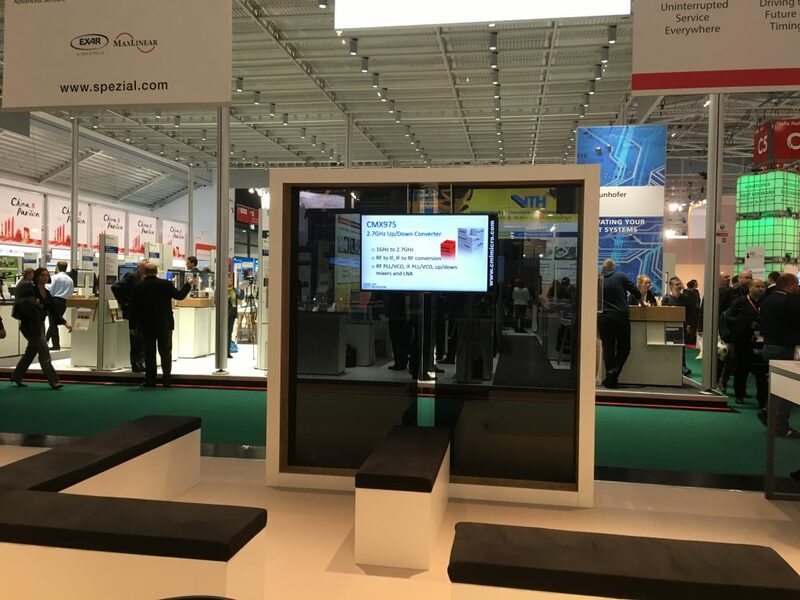 CML participated as a Co-Exhibitor with our German Distributor, SE Spezial Electronic AG, ensuring that we were listed in the Official Show Guide. The SE Stand was set up as a meeting place with several separate seating areas for discussions with visitors, surrounded by multiple video screens showing continuous presentations. CML featured on the screens with sections covering the newly launched CMX655 Codec and our RF Building Block product range. SE Spezial also placed a feature on the CMX655D in the electronic version of the Show Daily Newspaper. It was great to see that the halls were generally busy throughout all 4 days of the show, generating a very positive atmosphere. SE held after show receptions on their stand on the middle evening, providing a great opportunity for CML to network with customers and other suppliers. This year, Electronica saw over 80,000 trade visitors from 80 different countries. Falk Senger, the Managing Director of Messe München, announced that this was a “rise of 10% with an 8% rise in exhibitors”, and is hopeful that these numbers will continue to grow even higher during the next exhibition in 2020 . CML would like to thank everyone that visited us on our stand with SE Spezial Electronic AG.